Christian Braun obsesses over collectibles, antiques and toys more than the average person, but (he believes) in a productive way. 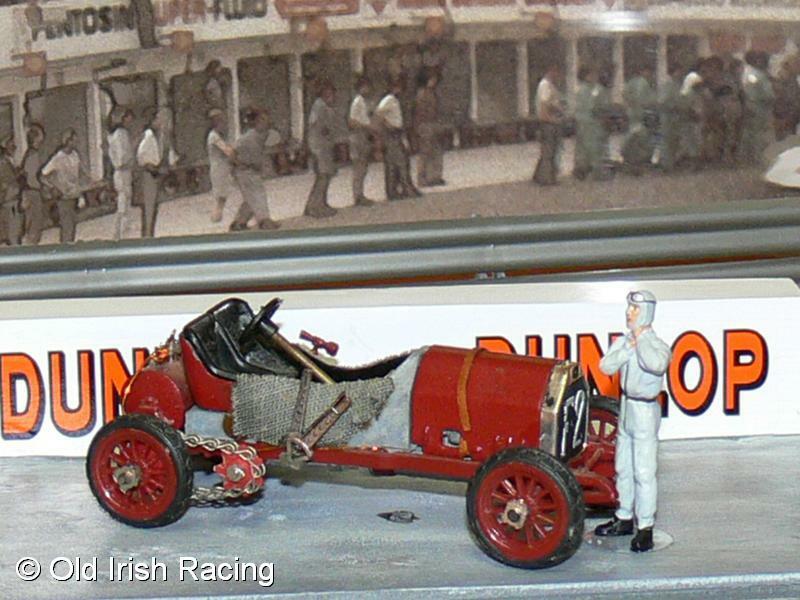 Diecast was a special area of interest ever since he helped his brother write a book about Siku Model Cars in 1987. When a former team member called and asked for some help to sell her late father’s collection we were only too happy to help (I wrote an earlier article on how to best sell a collection). When she then arrived with 20 boxes of amazing models I was glad we offered help, her father Jim just had an amazing collection, see for yourself here. But what really excited me was all the paperwork that she had. And the best were catalogs and other items from Sinclair’s Auto Miniatures! Since moving to the US and when meeting older diecast collectors I heard so much about Dave Sinclair and his store in Erie, Pennsylvania. Way before the internet, his catalog was sent to 30,000 collectors around the world and he had the most amazing selection! … and wanted to some Mercury Models with all those opening features! You had to fill this out by hand to order! But at least you got a FREE decal with an order over $10… Also, do not forget to lick the gummed flap to seal the form. When did you do that the last time? And then just fold the form in and send it in. How much I wish to go back in time to join Jim for a visit to Dave’s store in Erie. And I wouldn’t even cost that much money! Check out this letter from Sinclair’s with the then new Corgi Toys James Bond’s Aston Martin for $3.50! Well, I guess I am an ‘older collector’… I don’t want to admit it, but this brings back memories. I got many of his catalogs and ordered a few things from him. He even carried my favorite Teknos from little Denmark! Their prices were not the cheapest back then though! But I do credit Dave Sinclair for promoting and growing the 1/43 scene in the US. Thanks, Christian, for the memories! Thank you for sharing great dealers and their collections. It’s all new to me. I enjoyed all the detail. I was immersed in Matchbox MOY’s, never willing to expand the manufactures. I remember getting Mr. Sinclair’s catalog sometime in 1965/66 around the time I turned 10 years old. I hoarded every dime I could get to buy the Tekno Mercedes 280 SL hard top. My dad had just bought a Mercedes diesel at the time so I was very interested in the brand. The take-a-apart feature was fascinating. 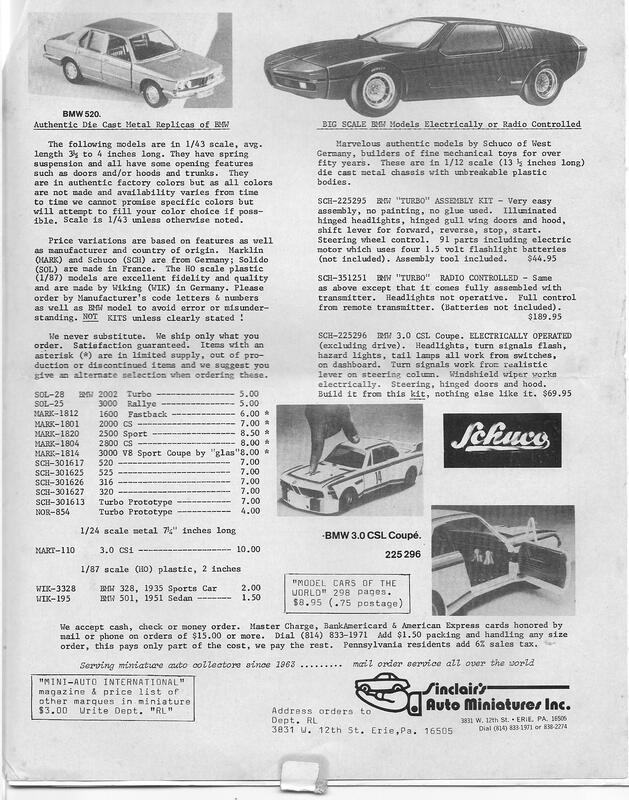 I continued to study the catalog daily with plans to buy other cars within, but with Rousch Hardware nearby with a large selection of Matchbox, Corgi, and Dinky, my meager income was consumed almost faster than I got it. I never did buy another model from Sinclair’s. Besides adding to my Matchbox collection, I also discovered model kits and slot cars aaaand Auto World!! I bought quite a bit from Dave back in the 70’s. In the days long before the internet, for someone that didnt have a large hobby store nearby; his catalogs were the way to find out about European manufacturers, keep up with news and buy new releases to build my collection. He was good about sending older catalogs out with orders, which always had good articles about diecast collecting. He was also supportive and wrote articles for Traders Horn, which was the die cast collectors classified ads to buy and sell models in the days before Ebay. I was glad to reconnect with Dave before the end, he was a great pioneer in our hobby. Still have some of his catalogs and a decal or two around somewhere. Thanks for the trip down memory lane! A Dugu Fiat F2 bought from Sinclairs. Here is a Sinclair ad from 1975 that appeared in “little cars” the newsletter of the BMW model collectors (part of BMW Car Club of America). Wish I still had the Schuco BMW 3.0CSL! Just add it to your hobbyDB Wishlist…. Robert – I saw those great Teknos and did end up getting them from other places. But I think I did get Rios and Dugus from Dave. Jerry – great to see you hear! I did not get that great Dugu Fiat of yours though. Great photo!